Everyday millions of people migrate all around the world. They move within their countries, to neighbouring countries and over the seas. They could be fleeing wars, natural disasters or migrating for economic reason. In the award-winning documentary. The Workers Cup directed by Adam Sobel, it is that group of people – migrant workers – who are the focus. . The documentary film tells the story of a group of migrant labourers from Ghana, Kenya and Nepal just to name a few countries. They are all migrant workers with a company in Qatar who are preparing for the 2022 World Cup which was awarded to the country in 2010. Leaving behind lives, families and dreams, the workers have travelled to Qatar in search of a â€œbetter life.â€ However, that is something that unfortunately they do not find. 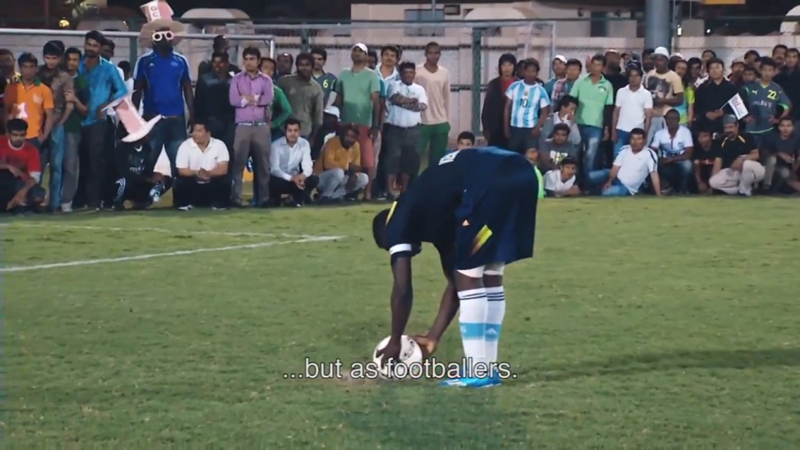 The film centres around a tournament – The Workers Cup – which was organised by the Qatar organising committee. It was sold as a way for the workers to experience the culture of football and to play in the stadiums and infrastructure that they were helping to build. However, the management in the film admit the tournament was about the workersâ€™ pledging their loyalty to the company. They wear the company colours, fly the company flags and repeatedly say they are playing for the managers and owners of the company. Where professional footballers play for club and country, these men play for company. Each of the players of the team make up the main characters of the movie. Audiences are introduced to who they are, who or what they left back home, what their dreams are and what they hope this tournament means for their future. Kenneth from Ghana was duped into coming to Qatar by an agent who promised him that he would be allowed to play football. That was far cry from what he found. So while the tournament was obviously put on with ulterior motives for Kenneth it represented an opportunity to show off his talent and hopefully get scouted. Many of the workers struggle with ideas of what it means to be free and whether with all the struggles that they are going through is there any point to life. For one of the workers, Samuel even the struggle of living in Qatar is nothing compared to his life in Ghana. He is a good goalkeeper and was playing football back home. However, he wasnâ€™t getting anything from it in terms of economic progress. Interspersed through the scenes of the workersâ€™ lives are statistics of migration in Qatar. The majority of people in Qatar are immigrants from all over the world. Sixty percent of the population of Qatar live in camps on the outskirts of Doha. While migrants regardless of which country they go to, in this case they are literally being relegated to the fringes of society. That unfortunately does not take place and once again the cycle continues. The workers at the end remain trapped. However, one thing the film tries to achieve and is evident is that the workers have agency. They made their choices for good and bad. They are not victims. What it does tell us is that workers around the world need better choices. They should not be constrained to have to choose the worst option and live with that. Football has always been deemed the beautiful sport. It is something watched by people all around the world and loved by all around the world. However, how many football fans think about who constructs the stadiums, who cleans up and who has to do the work once the lights go off. Beyond just showing us this, this movie gives one a glimpse into the human behind the worker. And for that it is an extremely powerful movie. 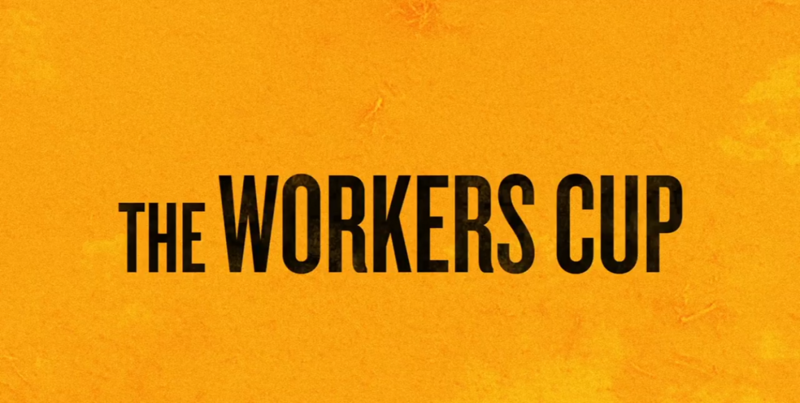 The Workers Cup is an expertly made film. The characters are well-developed. The filming flawless and enough suspense and drama to make the viewer forget that it is real life. And that it certainly is. As the producer of the film, Ramzy Haddad said itâ€™s a film for football fans but also anyone who is interested in finding out more about the construction workers of the great stadiums.